War is deadly business. And, if a kingdom or nation hopes to emerge victorious, they are wise to equip their soldiers properly. That’s why this fact, included in today’s Ripley’s Believe It or Not comic, is so shocking. It’s inconceivable that as the world marched to war in 1914, not a single one of the world powers equipped their troops with steel helmets. Elegant helms that looked superb on the parade ground . . . yes. Elaborate crests that exaggerated height to intimidate the foe . . . of course. Comfortable fabrics that kept the scorching sun off of the scalp . . . certainly. But steel helmets that might actually spare men from bullet and shrapnel wounds . . . not those. It’s not like the danger of ballistic wounds caught the Europeans off guard. Muskets had given way to deadly rifles long before. Artillery had advanced to the point where the Germans actually built not one, but two unique weapons: (1) Big Bertha, a huge howitzer that lobbed an eighteen hundred pound shell nearly eight miles, and (2) the Paris Gun, a siege cannon able to fire its shell eighty miles! 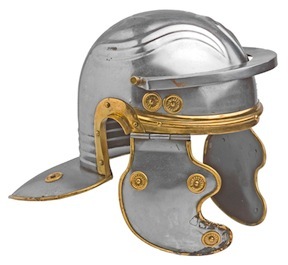 The irony about metal helmets is that even ancient peoples recognized the importance of protecting the skulls of their warriors with the strongest materials available. In my office I have a replica Roman legionary helmet. Trust me, it was capable of saving lives. Today’s combat helmets are highly advanced, and great effort is made to protect military members from head trauma. Sending them into battle with anything less than the best equipment available should be a crime. Excellent post. Military / combat wear across history is fascinating. One of my favorite pieces in our art museum is an Etruscan helmet. You do hope our combat guys are issued helmets as advanced as some of the football gear (entertainment) is…and not just one from the lowest bidder. Another ironic result of the introduction of metal helmets in the Great War was the RISE in the casualty rate of troops with head injuries. The reason? A soldier who was shot in the head while wearing a helmet was more likely to survive than one who was unprotected, however grave the ensuing injury (much like the principle of cycle helmets). The slight head wounds which previously resulted in a casualty being sent to hospital were averted or reduced to insignificance, but the real surprise was the increased survival rate of head wounds which would have been fatal beforehand.